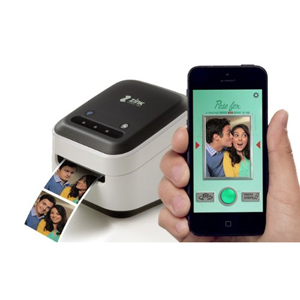 Ever wanted to print all your favorite photos from your smart phone, tablet, even your ebook reader then the Zink Happy Smart App Printer might be the solution for you. The Zink Happy will allow you to design and print directly to the it using wifi, meaning no wires and virtually anyone can setup to print to it. The best part is it is ink free, simply buy the photographic Zink Paper and you off and running. Great for scrapbooking, customized gifts, cards and the list is endless. With your help we can reach more people and let them know about Zink Happy Smart App Printer whether this product works or not. When I first received my printer, it worked fine for printing but I could never able to go into the store to download all the free designs. I e-mailed the Zink hAppy team, they are great, they tried to help me, but I finally gave up. I purchased the Zink hAppy+. It was really great because you didn't need to keep it pluggd in all time. I had it for several weeks before I started having problems. The printer wouldn't print and it would go off line a lot. I am getting ready to send my 6th Zink Happy+ printer back. I have asked for a refund.